Think fast: what are you going to do if the world is suddenly overrun with zombies? No answer? Well, perhaps it’s time you thought about that—with all the zombie-lore out there today, it’s hard to imagine the world won’t end with a takeover of brain-thirsty undead. Luckily for you, your trusty iPhone can help you—there are tons of apps that could save your life in the event of a zombie attack. Here are six apps that will be absolutely essential in the event of a zombie apocalypse. Of course, we suggest you download these apps sooner, rather than later, because we can’t guarantee that there will still be Wi-Fi or a 3G network when the world is swarming with an army of the undead. Zombie Survival Sheet (free): The first step to surviving a zombie attack is, of course, to be prepared—and what better way to be prepared for a zombie attack than with your personal zombie survival sheet? Imba Entertainment's free app allows you to fill in a survival sheet with words and pictures, so you don’t have to waste time thinking about, say, what to wear or what your last words will be when you’re face-to-face with the undead. Zombie Survival Sheet has spaces for you to type in your name, final last words, and battle anthem, as well as spaces for you to upload pictures of your weapons, clothing, stronghold, sidekick, and vehicle. Your finalized survival sheet can be saved as a picture on your phone, where it will just be a tap away, should zombies attack. Finally a homeland security scale I understand. Illustrated Zombie Survival Guide ($1): If you’ve got the Zombie Survival Sheet, but you’re not quite sure how to fill it out (What are the best weapons? What should your pants be made of? ), the Illustrated Zombie Survival Guide by Nikolas Kenyeres is your best bet for survival. The 28-page guide (with cute illustrations to keep you both relaxed and informed) includes info on appropriate clothing, zombie-combat, fortifying hideouts, and zombie history. The guide also includes an interactive exam to ensure you can recall your newfound zombie knowledge in a stressful (read: zombie-filled) situation. Read our full review. Sadly absent: how to survive the undead. wikiHow: How to and DIY Survival Kit (free): Chances are you'll need more than just zombie-related survival tips if you want to make it out of the Zombocalypse in one piece. Sure, it’s great that you know how to chop a zombie to pieces, but what if you need to kick down a door? Survive a long fall? Make water in the desert? These are all issues that could arise—say you need to kick down a door to enter a supply shed full of weapons, or you need to survive a long fall because you’ve been forced out a third-story window by the relentless undead, or you need to find water in the desert because you’ve been wandering across it in search of living people. 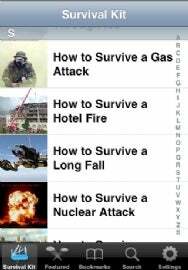 Enter the wikiHow: How to and DIY Survival Kit app—a collection of articles on surviving any imaginable situation (except for a zombie attack—that’s why you have the other apps). This free app from wikiHow will be absolutely indispensable in a post-apocalyptic world, and the articles are available at all times, whether you’re connected to the Internet or not. Read our full review. Zombie Survival Kit ($1): Now that you’ve done all the prep for a zombie attack, it’s time to focus on what to do if you actually come face to face with them. For that, there is the Zombie Survival Kit app from Sperensis Developer. For just $1, you get four tools to help you communicate with the zombies, and one game (to pass the time if they move like they’re, well, dead). There’s a zombie translator, which is stocked with popular zombie phrases (such as “next door tastes like chicken”). There’s also a zombie song maker (if talking doesn’t work), a zombie insulter (if you just want to make them mad), and a “hypnotic zombie” video that promises (sort of) to (hopefully) reverse the process of zombification if you or one of your friends has been bitten. Read our full review. Flashlight (free): There’s more than one reason to have this free flashlight app from John Haney Software downloaded on your iPhone. Not only will it provide you with a shining beacon of white light (or any other color you wish), it also features a strobe effect. The flashlight part of the app will be essential to your survival in a zombie apocalypse, as electricity may be out (zombies, for some reason, are always wandering around abandoned warehouses and places with no power), and it would be really sad if you survived a zombie onslaught only to fall down a flight of stairs and break your ankle. At the very least, shining a bright light in a zombie’s eyes is sure to confuse them for a split second—which is all you need, of course, to get away. Zombie Saw ($1): Naturally, in the event of a zombie attack, you’re going to need some sort of weapon with which to destroy the zombies. While we can’t offer you that (hey, the iPhone is not a wonder-machine—for that, see the iPad), we can offer you this awesome Zombie Saw by LUK*E. Zombie Saw is an application that turns your iPhone into a (virtual) saw—simply launch the application and then tilt your iPhone 90 degrees to start running the motor. The zombie saw. Don't leave home without it. While it’s not tremendously useful against non-virtual zombies, it is essential in the event of a zombie attack. 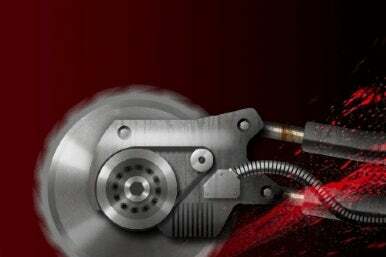 Zombies know that chainsaws are the key to their demise, and this app (with its subsequent saw-sounds and blood spurting) will work just like the Scare Bear Trail Companion and keep zombies at bay with the fear that you might have a real saw. 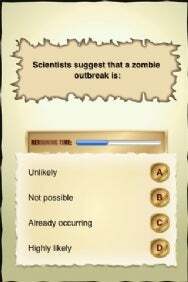 Zombies are probably dumber than bears, so this app might get you further than you’d think.